For this year, I decided that Yancy needed a website. Rather than build a website with a static site generator like Statocles, which is so popular these days, I decided to do something wild and unpredictable: A dynamic website! Lucky for me, I have the perfect project to easily build a dynamic website: Yancy! The key part of any dynamic website is the database. Since I just want to write Markdown and render HTML, my schema is quite simple: A place to store the page's path, a place to store the page's Markdown for editing, and a place to put the rendered HTML. I set up a SQLite database and build the pages table using Mojo::SQLite::Migrations. With our database table prepared, I need a way to edit my pages. 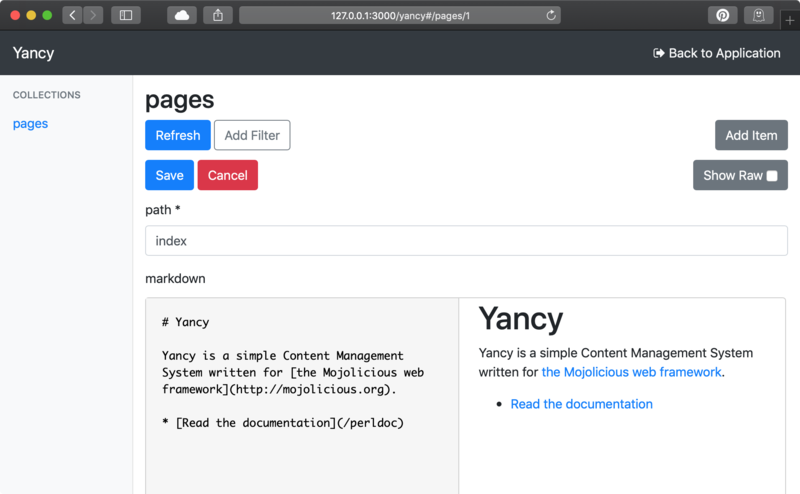 Yancy's built-in editor comes with marked.js to render Markdown into HTML. I just need to tell it which column is Markdown and where to store the HTML. We'll use the path as the ID to make it easy to retrieve our pages. Now we can create some pages. I can start up the app with perl myapp.pl daemon, and then edit my content by visiting http://127.0.0.1:3000/yancy. The site will especially need an index page, so I'll create one. With our content created, I need to add a route to display it. Using the * wildcard placeholder, the route will match any path. 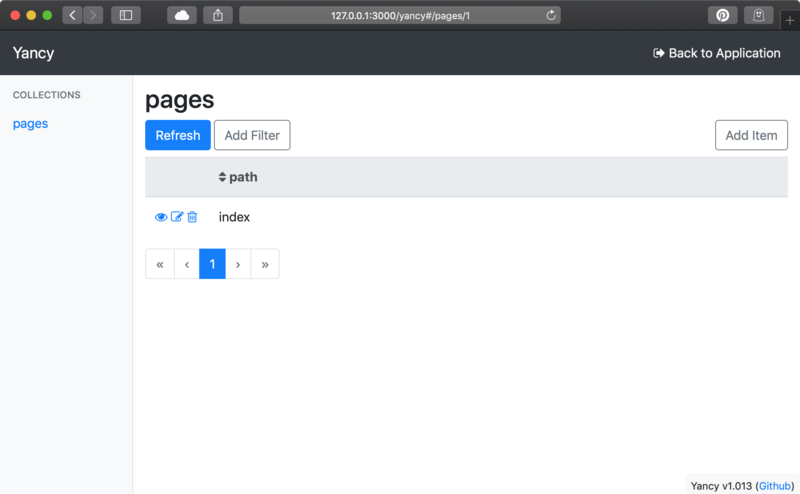 I can then look up the page requested from the database using the Yancy controller get action. I set a default of "index" to pull our index page when users visit "/". Last, the route will need a little bit of a template just to display the page's HTML and a layout with some useful links and maybe some Bootstrap to make things look a bit nicer. Now I can open my website and see the index page I created!